Every Thursday I spend an hour at an Adoration Chapel in my city. I have the noon hour and Alice has the 11 to 12 time slot. I enjoy when her granddaughter comes to pick her up because she often brings with her a sweet dog she found in Puerto Rico. This dog is one very lucky dog indeed, because not only is there an overpopulation problem in Puerto Rico. But many of them suffer greatly from the government's and people's indifference to their welfare. Per the New York Times- an incident in October at three housing projects in a Puerto Rican town revealed what happened to some innocent dogs and cats. The men working for the city entered the projects and rounded up dozens of them. They said that they violated the housing authority's no-pets policy and took them away. A lawsuit was filed on behalf of the 33 families who claimed that the city employees and contractors---"drugged and brutalized dozens of animals and then flung them from a 50-foot-tall highways bridge into a weed-choked ravine and left them to die". As might be expected --witnesses found a pile of dog corpses and skeletons beneath the bridge and neither the contractors nor city officials claimed responsibility. Thankfully, this horrific case of animal cruelty brought international embarrassment to Puerto Rico. It also vindicated animal rights advocates who had long tried to draw attention to the plight of animals on the island with little success until now. Sadly, this inhumane disposal of animals is routine. Unwanted dogs, cats, and even livestock are hurled from bridges with the intent that these innocent animals would be crushed by vehicles or even butchered with machetes. What is the government doing about this animal cruelty?---Absolutely nothing. But finally with the Barcelona incident appearing in the news, and the clamor of the 33 dogs and cats, lawsuit by the 33 families the government is reacting. They are also concerned that this news of animal cruelty will affect tourism. Finally there came a long overdue admission by Carlos M. Carazo, the director of the animal disease Division of Animal control: "In our culture we have not addressed these issues because, probably, we did not think they were important." Yes, he got that right, and it should be an admission of shame as well that God's animal creatures seem to mean so little to a majority of the people and its officials. I wish that Pope Francis would become more aware and involved with the incidences of animal cruelty- such as this and especially in the other Catholic countries like Spain, Mexico, and the Philippines where animals are often mistreated. Yet, many of the Asian countries are also quite insensitive to animal suffering, but they could hardly be expected to be concerned about what the Holy Father thinks. Even Catholic countries do not always pay attention, either. One long ago Pope told Spain to stop the bull fights. Of course, it is quite evident that his bullarum was ignored. Per the Times report there was an assessment most of us cannot fault: "Puerto Rico, among United States territories, has long had a poor international reputation for the treatment of animals. There is no government program for mass sterilization or registration of pets and little animal welfare education in the schools. The island has only about a half-dozen animal shelters, and while municipalities are charged with rounding up strays, that duty has largely been ignored, government officials and animal advocates say." But not only are Puerto Rican officials uncaring in this matter, the animal advocates tell us that Puerto Rican pet owners will often dump unwanted animals along roads or on beaches. As a result, roaming packs of neglected dogs are common in many towns. One tourist sent an email to the San Juan Save a Sato (street dog) Foundation and said: "I visited P.R. a few years ago and was appalled and literally sickened by the homeless dog situation. I spent my entire vacation feeding stray dogs. The trip was miserable and horrible and I swore never to return and will tell everyone I knew about the experience." Mission accomplished. 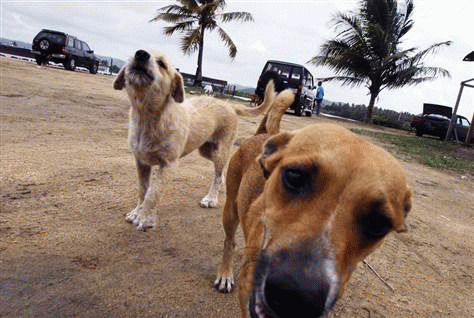 And thanks to the New York Times for an eye-opening expose of what these poor dogs and cats experience in Puerto Rico. It is really a shame.